The Jewish community coming together in the days after a tragic attack on their religion. “It’s been very difficult, the senseless killing and the whole atmosphere that is permeating the United States, the divisiveness, that is just so disheartening,” Hank Feuerzeig a member of the Hebrew Congregation of St. Thomas said. Feuerzeig has been attending Shabbat Services at the Hebrew Congregation of St. Thomas for the last forty years. After the shooting at a Jewish Synagogue in Pittsburgh, Pennsylvania he found himself looking for a way to find hope. “There are moments in our lives where we know, we either have to speak out or we have to do something. It’s not any more about what’s happening out there. It really is almost a question of who we are,” Rabbi Michael Feshbach with the Hebrew Congregation of St. Thomas said. In the hours following the attack, Rabbi Feshbach immediately organized a special Shabbat service. He didn’t just invite the Jewish members of the synagogue. He opened it to all. “We were invited here with some friends and when they said a lot of the purpose of the service tonight was to honor those that were attacked and that had died in the states and we just thought it would be a great thing to be a part of and as it turned out I’m really happy we came,” Richard Hawkins who was visiting from Seattle, WA said. Nonmembers, people of all faiths and local religious leaders came to be a part of the night. They said it taught them more about their own faith by being here Friday. “It just breaks down the barriers of ignorance and often times we live out of ignorance sometimes even as faith leaders not only ignorance in terms of the faith expression but even ignorance in terms of the person who is a part of that faith experience,” Mikey Roberts with the Memorial Moravian Church said. 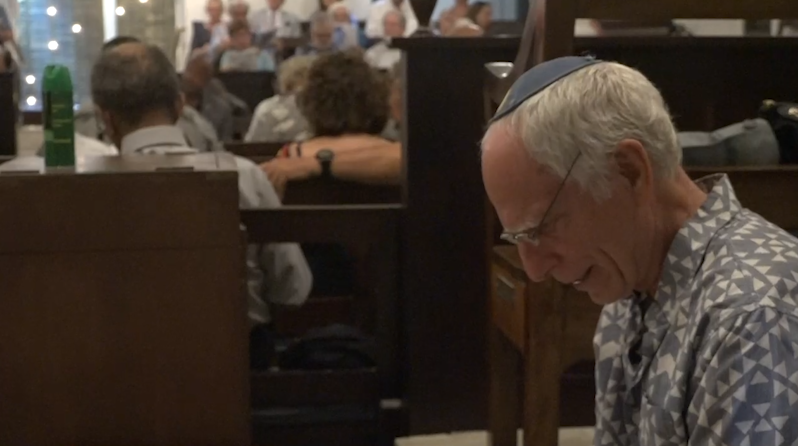 For members like Feuerzeig, that have been coming here since the 70’s, the night showed that nothing will stop him or the other members of The Hebrew Congregation of St. Thomas from coming here and practicing their faith. “It was wonderful be here where we have been, me my wife my wife Penny and I moved here with two kids in snow suits, in 1972 and we’ve been blessed from the day we arrived,” Feuerzeig added.